In the year 1939 the german scientist Otto Hahn invented with the assistence of Fritz Strassmann the splitting of an uran atom. During the second World War the german scientists worked very hard to build an atomic power station. At the end of the war the germans were nearly able to build an atomic bomb. In the year 1943 american agents in germany heard about the research of the atomic bomb. Two years later the americans dropped a bomb on Hiroshima and on Nagasaki. Thousands of people died, the citys were destroyed and till today many people died on the results of these bombs. The nuclear reaction produces heat. With this heat water will be warmed and then it drives the generator. The generator produces lots of electricity. The hot water will be cooled in this huge cooling towers. Today in europe are 218 atomic power stations working. They produce more than 178 billions watt. In France there are 56 nuclear power stations which produce more than 75 percent of electricity who is needed there. The germans have only 20. Now europe is building 25 nuclear power stations. 20 percent of the electricity who is needed in europe is produced by the nuclear fission. Now in the whole world there are 442 nuclear power stations working. 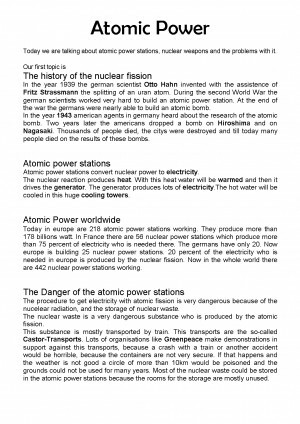 The Danger of the atomic power stations The procedure to get electricity with atomic fission is very dangerous because of the nucelear radiation, and the storage of nuclear waste. The nuclear waste is a very dangerous substance who is produced by the atomic fission. This substance is mostly transported by train. This transports are the so-called Castor-Transports. Lots of organisations like Greenpeace make demonstrations in support against this transports, because a crash with a train or another accident would be horrible, because the containers are not very secure. If that happens and the weather is not good a circle of more than 10km would be poisoned and the grounds could not be used for many years. Most of the nuclear waste could be stored in the atomic power stations because the rooms for the storage are mostly unused. The Tschernobyl desaster On the 26th of April the technicians of the atomic power station in Tschernobyl started an experiment. They shut of the security system to try out how long the reactor will produce electricity when he is shut down. Six seconds after the start the cooling system broke down. The reactor was overheated and exploded. 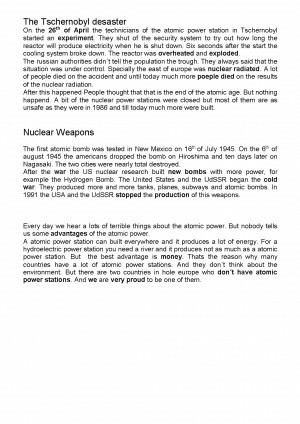 Descărcarea referatului cu titlul "Referat Engleza Atomic Power Nuclear Fission" este gratuită. Completezi informațiile din formularul de comandă și imediat după aceea vei primi prin email link-ul de descărcare.